This time round, I’d like to share some books related to petroleum engineering. There are some of my friends working as lecturers and departmental heads in some technical institutes. They are asking me to share petroleum engineering related books. Today we all are quite lucky that internet can provides a lot of information we need. The only thing we need to know how to find out these resources. This helps people who eager to find out what they wanted to know, but in other way round there will be a big gap between those who are willing to find and not willing to find. I am always saying to my friends that this time is a race of knowledge and information. 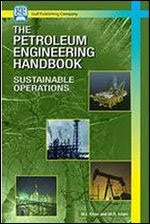 Volume I, General Engineering, includes chapters on mathematics, fluid properties (fluid sampling techniques; properties and correlations of oil, gas, condensate, and water; hydrocarbon phase behavior and phase diagrams for hydrocarbon systems; the phase behavior of water/hydrocarbon systems; and the properties of waxes, aspartames, and crude oil emulsions), rock properties (bulk rock properties, permeability, relative permeability, and capillary pressure), the economic and regulatory environment, and the role of fossil energy in the 21st century energy mix. General Engineering, Volume I of the new Petroleum Engineering Handbook, has been designed to present material that is needed by all practicing petroleum engineers. It includes chapters on mathematics, properties fluids, rock properties, rock/fluid interactions, economics, the law, and the social context of fossil energy. The mathematics chapters of this volume are a major departure from previous editions. The mathematical tables presented in previous editions are now readily available using hand-held calculators or software on desktop computers. The mathematics chapters present mathematical topics that petroleum engineers need to better understand literature and the software they use on a day-to-day basis. Topics such as vibrating systems, ordinary and partial differential equations, linear algebra and matrices, and Green’s functions are introduced and references are provided for readers who would like to pursue the topics in more detail. The discussion of fluid properties covers fluid sampling techniques; properties and correlations of oil, condensate, and water; hydrocarbon phase behavior and phase diagrams for hydrocarbon systems; and the phase behavior of water/hydrocarbon systems. Two chapters consider the properties of waxes, aspartames, and crude emulsions. Rock properties and rock/fluid interactions are discussed. The rock properties include bulk rock properties, such as porosity, elastic rock properties, and rock failure relationships. Measurement techniques and models of single phase permeability are then presented, followed by a review of the properties that describe the interaction between rocks and fluids, notably relative permeability and capillary pressure. In addition to mathematics, fluid properties, and rock properties, petroleum engineers need to understand economic and legal issues. Essential aspects of the economic and regulatory environment are addressed in the section. A brief review of the role of fossil energy in the 21st century energy mix ends the volume. The second book is Working Guide to Petroleum and Natural Gas Production Engineering. As usual, here are some descriptions for the book also. Based on the classic Standard Handbook of Petroleum and Natural Gas Engineering, Second Edition, the Working Guide to Petroleum and Natural Gas Production Engineering begins with an extensive overview of the basic principles, definitions, and data. Later chapters cover properties of hydrocarbon mixtures, flow natural flow of fluids, natural flow performance, artificial lift methods and corrosion and scaling. This book provides engineers with a bases for understanding important concepts such a flow phenomena, hydrate formation, pressure (surge) waves, or high viscosity liquid flow failure. The focus of book is to assist the reader to understand and avoid potential operational challenges and design effective solutions and operational responses. Completions are the conduit between hydrocarbon reservoirs and surface facilities. They are a fundamental part of any hydrocarbon field development project. The have to be designed for safely maximizing the hydrocarbon recovery from the well and may have to last for many years under ever changing conditions. Issues include: connection with the reservoir rock, avoiding sand production, selecting the correct interval, pumps and other forms of artificial lift, safety and integrity, equipment selection and installation and future well interventions. Petroleum Engineering Handbook from 4shared, ifile. Working Guide to Petroleum and Natural Gas Production Engineering from 4shared, ifile, Google. Well Completion Design, Volume 56 from 4shared, ifile, Google.